First comes love, then comes marriage, then forget about babies and golden carriages because we're all about the honeymoon. A post-nuptial holiday is the first chance the happy couple get to relax after saying their "I dos", so it needs to be two things: relaxing, and Instagrammable. How are all your wedding guests going to know you're 'mooning if you don't post a million pics a day to Insta? Here's our top picks for the most beautiful honeymoon destinations around the world - no filter needed. We'll admit it, it is insanely hard to pick a place to go in Italy without getting FOMO for all the other places it has to offer. But this little atoll has been dubbed "pink paradise" due to the turquoise waters and coral pink sand. I mean sure, other areas of Italy may fulfil all your pasta needs, but nowhere can give you a pink beach quite like Budelli can. When, in 1620 BC, a particularly violent volcano erupted on the island of Kallisti, the caldera left behind formed the Santorini that we know and love today. You should totally get a boat over to this island so you can properly take in the white houses built into the lava cliffs, it's a sight that needs to be seen to be believed. What more could you want from a honeymoon than to be boozed up on delicious, locally-made wine for two weeks? Sonoma is a historic city based in northern California and is at the heart of the Sonoma Valley winemaking region. It boasts a gorgeous weekly farmer's market and plenty of art galleries for you to explore. When you're not doing that, you can taste all the vino the area has to offer. And the views aren't bad either. Try enough wine and it's probably enough to make you cry with joy. Bergheim is a cute little commune in north-eastern France. It is a completely fortified town with the most amazing walls and towers. Quaint buildings line the stress and are adorned with the sweetest flowers. Perf for the low-key kinda honeymooners. 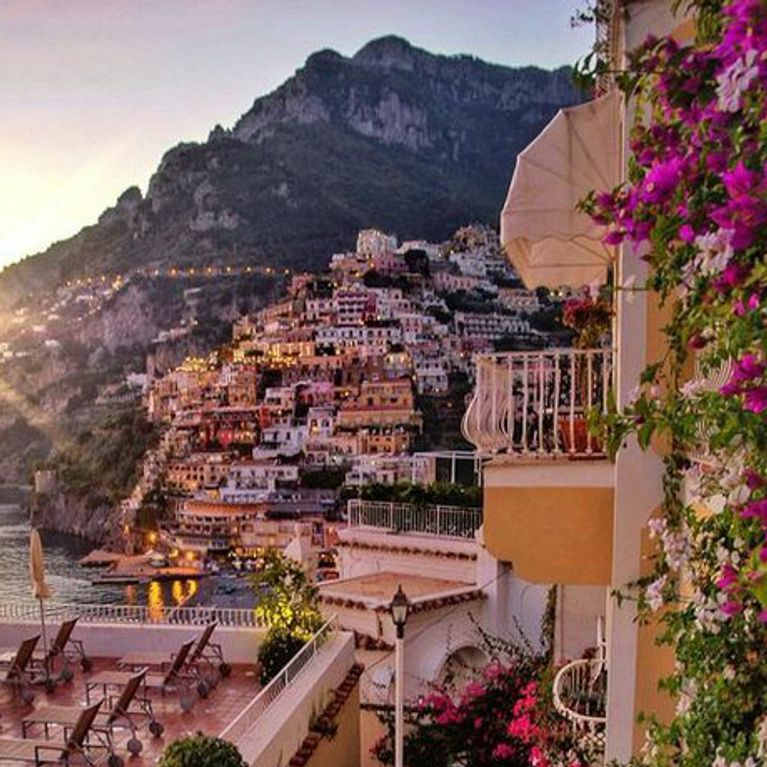 There's nothing quite like the dramatic beauty of Italy's Amalfi Coast. Quaint little buildings clustered on the mountainside leading down to the sea, you're going to have a stunning view whether you're looking out or looking back. Visit Sorrento's Piazza Tasso, for the perfect coffee with an even better view. Who says you have to go abroad to see some amazing sights? Scotland has so many awesome places to go and visit on your honeymoon and you should definitely try and visit them all, but an overnight stay in the Enchanted Forest, Pitlochry is necessary. Dazzling visuals set to an original music score lights up the woodland in the autumn months. It's a sight not to be missed. Where better to spend time with your loved one than the most romantic city in the world? Wonder the Louvre, eat macarons by the river or spend your day lazing in a little French cafe with a glorious glass of red, the world is your huître. Honestly, have you ever seen such a glorious lake? If you can draw your eyes away from it, there's plenty of other things to explore in Thun too, such as its Romanesque churches, historic Old Town and 12th Century castle. We know, we know - pretty much everywhere in Bali is b-e-a-u-tiful, but you gotta make time in your trip for Ubud. Great food, great culture - not to mention the monkey forest, nearby rice fields and the infamous Instagrammable swing high up in the treetops. If you're wanting to take loads of photos, Kyoto is your perf destination. The area is known for its picturesque gardens, classical Bhuddist temples and geishas. Not only that but the food is amaaazing. It's a must. There's no end of things to do in Canada - the hard part is picking what to do and what to skip. But you can't skip out on the Canadian Rockies - it's too glorious to miss. Large snowcapped peaks frame the mountain range, filled to the brim with alpine lakes and all kinds of wildlife. And there's plenty of outdoor activities to get stuck into if you're the active type. Castries in St Lucia is known for its palm-lined Vigie Beach, lively markets and colourful murals, with stunning mountain views and not to mention the best beaches. It's got to be done. You have my word that you will not find a more stunning beach anywhere in the world. Look at that sea. Just look at it! Prepare to get hella wrinkly because you are not going to want to get out of that water. If you fancy a bit more of an exploring holiday Québec City is ideal for the more cultured honeymooners among us. Sitting on the Saint Lawrence river, Quebec is mostly French speaking and is dripping with history. The deliciously quaint Old Town is a Unesco World Heritage site, featuring cute cobblestoned streets and the Château Frontenac takes centre stage in the middle of it all. If you do Croatia, you just have to do the sea caves. Is there anything more romantic than splish-sploshing around in these crystal clear waters inside a cave? No, no there is not. So get your snorkel mask ready, 'mooners! If you and your hubby are more of an action couple than a lazing-on-the-beach couple, then Karijini national park will be right up your street. With plenty of hiking trails and indigenous animals to gawp at, there's enough to keep you busy for a good two weeks. Plus one of the trails leads to this gorgeous Handrail Pool, which let's face it, you can't be mad at. I can say this with confidence: you will never find anywhere quite like Cappadocia anywhere else in the world. The area is known for its tall rock fomations known as "fairy chimneys"​. And their annual hot air balloon festival will be one of the most beautiful things you see - not to mention the most Instagrammable! Now, you can't go wrong with Hawaii as a honeymoon destination. But if you really wanna get your money's worth, you need to do the White Road hike on the Big Island. Not only is it a beautiful hike, but you'll discover this awesome hidden slide that let's be honest, you'll be spending hours playing on. Maneka Cove literally looks like a computer screensaver, and that's why it's the ultimate 'mooner destination. If all you require from your post-wedding holiday is sun, sea and sand, then Maui will tick all those boxes a hundred times over. Vegas baby! Who wouldn't want to gamble away all their hard earned cash in the city of sin? Whether you're getting cocky on the fruities or devouring a burger as big as your head, there's plenty of things to do in Las Vegas - including travelling by gondola. Honestly, who needs Venice when you can get it all in Vegas? Look, not everyone can afford a honeymoon abroad, which is fine because luckily we have some great little treasures right here in the UK. You can't go wrong with Cornwall, and St Ives is pure beauty right there on the coast. It's got something for everyone: coastal trails for the walkers, gorgeous seafood restaurants for the foodies, and glorious waters for the beach bums - plus stunning views for miles. If you can handle the heat, Marrakech has the most beautiful streets that explode with colour for you to explore. It's jam-packed with mosques, palaces and gardens, as well as thriving souks selling textiles, pottery and jewellery. Now all you have to do is work out how to fit all those souvenirs in your suitcase. If you love a mix of sea, sand and shopping then Dubai's your guy. Not only will you have your pick of the best beaches and designer shops, but there's also plenty to see and - more importantly - plenty of perf picture opportunities. Go to the top of the Burj Khalifa, dare yourself to skydive, or take a look at the magnificent Lost Chambers Aquarium in the Atlantic Hotel on the palm. Hey, hot honeymoons ain't for everyone. If a cold climate with cosy natural springs takes your fancy, Iceland is where you need to go. Stay in a thermal glass igloo to see the Northern lights, snorkel between the tectonic plates in the clearest water you've ever seen, or simply chillax in the natural springs. If you're gonna do a honeymoon right, you've just got to go with Bora Bora. Clear seas, clear skies and the nicest sand you've ever touched in your life, this place should come with a warning - trust me, you're never going to want to come home. The Ultimate Wedding Checklist: What Every Bride Needs For Her Big Day!